« What do all these people have in common? One of the saddest recent facts about the world, and especially the twentieth century world is that the Devil has tended to have the best tunes, the best pictures and the best public sculpture. By the middle of the twentieth century, World War 2 having been at least partly won by some of the Good Guys, many officially encouraged Artists in the rich West had come to associate all tunefulness and all pictorial or sculptural communicativeness with evil, and to shun artistic communicativeness on purpose. Is this picture telling a story? Does that symphony have lots of tunes? Is this sculpture of something or of someone, and does it speak to the best in us? To hell with that, said many of the more serious and educated sorts of Artists, because such glories reminded them that Artistic glory had just been and was typically then still being used, by Hitler and by Stalin and by their numerous imitators around the globe, to glorify wickedness. Meanwhile, the horribly numerous and influential supporters within the better bits of the world of the still persisting and Communistic sort of evil went out of their way to encourage these mostly dismal and arid Artistic tendencies, in order to make the best bits of the world seem far more uninspiring than they really were, and hence ripe for conquest by the Communistically evil bits. Artistic glory continued, well into the late twentieth century, when the very worst of the twentieth century’s greatest horrors were politically and economically in retreat, to glorify the dreary and still decidedly evil aftermath of the horrors, in the USSR and in all the places it continued to subjugate or influence, such as in China and nearby despotisms. The rule was, still, that the better the mid-to-late twentieth century place was and the more it was contributing, despite all its corruptions and blunders and disappointments, to the ongoing advance of humanity out of mass poverty and into mass comfort and even mass affluence, the duller and more uninspiring its officially sponsored Art was. Thank heavens for the less official, small-a art, like advertising and the more commercialised parts of cinema and television, and like pop music. Above all, thank heavens for rock and roll. 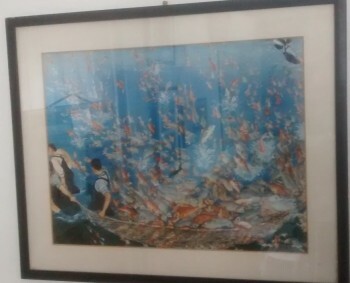 If Official Art refused to celebrate the escape, in the rich countries, of the poor masses from their poverty, then the enriched paupers would buy electric guitars, form ten million pop groups and celebrate their newly emancipated lives for themselves. The rock-and-rollers didn’t “build this city on rock and roll”. The city was already built. But by God they cheered it up. And this despite all the efforts of Official Art people to make rock and roll dismal too. This gigantic and inspiring celebration of human progress and traditional family values was erected by the sculptural propaganda arm of the abominable state of North Korea, that classic after-echo-of-horror relic that still now staggers on into the twenty first century. To the exact degree that Africa is now starting seriously to shun the follies of North Korean style murder-suicide-statist political-economic policies, Africa is indeed now starting to make some serious economic progress, thanks to things like free trade, mass literacy and mobile phones. Well fed African go-getters with adoring wives and happily well fed babies are now multiplying across the continent, busily exploiting the potential of such things as mobile phones to stir up affluence, for others as well as for themselves, perhaps some of them even inspired in their capitalistic endeavours by sculptures like the one above. I personally believe that the famously colourful and inspiring Chinese posters that were among the very few pleasing things created during the otherwise wholly dreadful and destructive Mao-Tse-Tung era in China may have had a similarly inspiring impact upon China’s subsequent generation of capitalistic go-getters. Communists had a minus quantity of knowledge about how to create the good life, but they at least had a clue about what the good life looked like and felt like, and got other and less crazed persons thinking about how actually to contrive it. Meanwhile, public sculpture in the old rich parts of the world has, for some time now, been on the up and up, or so I think. It may not be gloriously inspiring, but at least it has started to be – has for some time actually been, I think, some of it – fun, at least quite often. Official Art still can’t quite bring itself to be as brashly optimistic about humanity and its future as those North Koreans, but at least the baleful representation-equals-Hitler-and-Stalin equation is sinking into the cultural history books. Good riddance. Personally, and in company with many other people who are not usually very attracted by or admiring of contemporary Art, I particularly like the works of Antony Gormley. 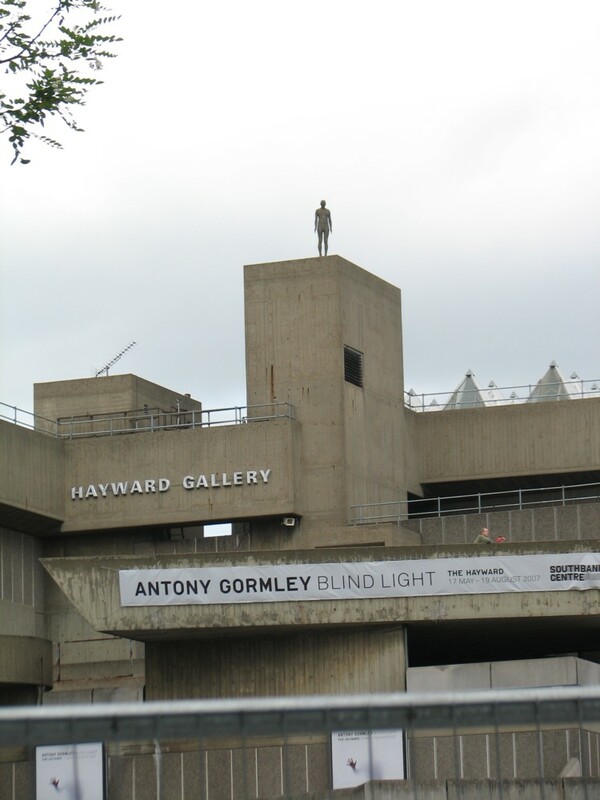 There was recently a show about Gormley on BBC4 TV, which illustrated only too vividly that Gormley emits the same drone of vacuous and pretentious Art-Speak nonsense that most other Artists seem to. The contrast between the educated verbal gropings that Gormley talked on TV last night with the down-to-earth clarity achieved by the comic book artist Frank Quitely, who starred in an earlier BBC4 show in the same series, was extreme (see my remarks above about the redemptively inspirational contribution of popular art to Art). But ever since Gormley stumbled into popular acclaim with his Angel of the North, which proved a whole lot more inspiring to the wider public than he probably thought it would, he has specialised in doing public sculpture that is of something (typically his own very average naked body but never mind), and which many people, me included, often enjoy looking at. His actual work is, I think, as often as not, brilliantly eloquent, and he is now finding it easier to do it, what with the new technology of 3D computer scanning and visualisation and 3D printing. Gormley’s actual Art makes me want to say, not so much that his spoken words are silly (even his sculpture titles tend to be Art-Speak meaninglessness), but that words are just not Gormley’s thing. Stick anyone on a pedestal – in general, look up at them – and they look more impressive. They look like they deserve to be looked up to. This positioning of all those South Bank Gormleys suggested (yes yes, to me – I admit that all this is very personal) ordinary men at least looking, very admirably, towards less ordinary and more inspiring far horizons. Some of the Gormleys were looking downwards, but most were looking out ahead. What all these Gormleys were not doing was just standing in Art galleries, staring miserably at their own feet, with signs next to them full of demoralising Art-Speak drivel. They raised the spirits of almost all of those who gazed up at them. Only those Art People who hated what a popular hit the Gormleys were and who still want Art to just moan about the horrors of capitalist consumerism, instead of actually making a positive contribution to this excellent trend in human affairs, were seriously offended by all these Gormleys, which for me is of course just another reason to love them and to treasure the memory of them. I and most other Londoners and visitors to London who saw them regretted only the moment when they migrated elsewhere. If and when the ghastly government of North Korea is overtaken by the collapse that in a wholly just world would immediately engulf it, I wonder what will happen to these North Korean sculptors. I now like to conjecture that, despite all the barbarism that they now go through the motions of glorifying, they might yet have some kind of civilised future, glorifying people and things that truly deserve to be glorified. It would be nice to see the spare plinth in Trafalgar Square have on it statues of Sir Sidney Camm and Reginald Mitchell, (pipe in mouth) one arm each outstretched, hands giving flight to a Merlin (the bird), with Roy Chadwick and Sir Barnes Wallis looking on approvingly. In another corner of the square, a new plinth, John Randall and Harry Boot pore over a cavity magnetron, and in a cubby hole beneath them, someone is tinkering with an Enigma machine wheel, notepad on desk. All paid for by public subscription. And then send a Lancaster to obliterate the monstrosity of the South Bank Centre, then a further sortie targetted on the Ministry of Culture, Media and Sport, or whatever it calls itself. Alas, my first thought about that photo of the Hayward Gallery was that it was of someone about to jump. The curious thing about public sculpture is few people ever look at it twice. And they’ll be foreigners. Speaking as a born & bred Londoner, I haven’t a clue what’s in Trafalgar Square bar a column & a vague impression of lions. Nor ever had the slightest interest. If you took the lot away; Eros, Wellington, the Boudicca thing, wherever that is, I doubt I’d notice. They’ve nothing whatsoever to do with my personal city. Much the same in my adopted home, which seems to have more public monstrosities than you can shake a stick at. They’re just things in the middle of road junctions require driving around. The decline of the arts (everything from music to building to painting a sculpture)can be dated from well before World War II – but in the post war period, decline became collapse (or semi collapse). It was most obvious in painting – but all the arts were effected. Sadly this collapse in taste was associated with “freedom” – which is as absurd as the “Market Monetarists” claiming that endless funny money backed by the government Central Banks supporting credit bubbles, is a “free market policy” (which is exactly what they do claim – there they are, these American “economists”, talking to the blond “Russia Today” presenter even as I type these words). Creating money from nothing is not freedom and painting so badly that one can not tell which way up to hang the painting is not freedom either – it is not freedom because (in the end) it all depends on GOVERNMENT SUBSIDY. What is agency? What is human freedom? Doing one’s own work and accepting the consequences of ones chosen (chosen) actions. Not composing “music” that makes the ears of people hurt (and then demanding subsidies from the taxpayer for this expression of “artistic freedom”). And not lending out “money” that one (indeed no one) has ever saved – and then (when things, inevitably, go wrong) just pocketing more money from the Central Banks – in order to “maintain a steady growth of nominal GDP of four to five percent a year”. Asset price bubbles (created by the lending out of “money” that no one ever saved) must “never be allowed to collapse” (that is not adult freedom – that is playpen, with no consequences for folly). Concert Halls must never be allowed to be empty (and close down) no matter how crap the “music” they put on is. That is the “free market policy”. Freedom from reality is not freedom at all. It is demented dream-like existence – which is always (in the end) at the expense of other people. 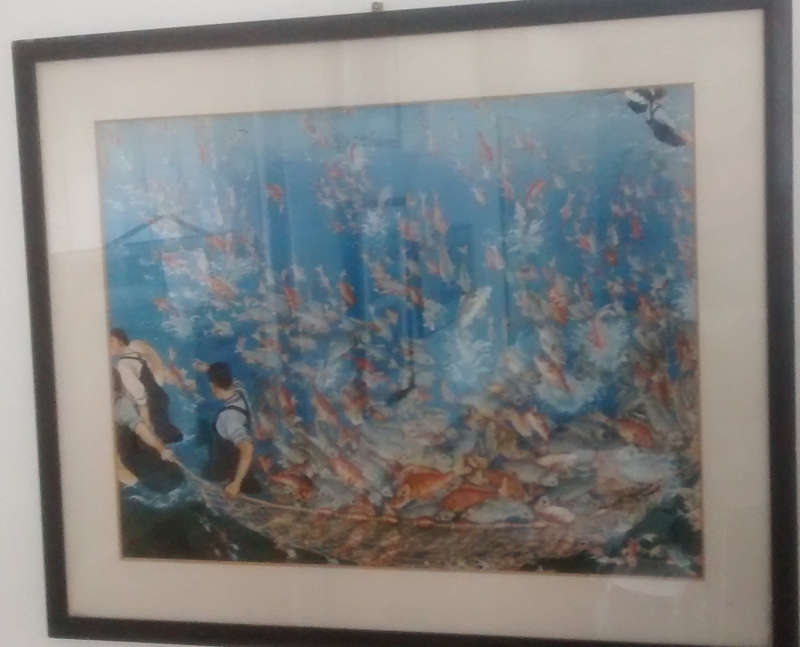 I remember falling in love with the style of the “peasant art” of Huxian in China when I first saw an article about it in the Sunday Times. In fact many of the paintings were either heavily influenced by or actually produced by disgraced professional artists forced into exile in the villages and officially forbidden to work themselves. 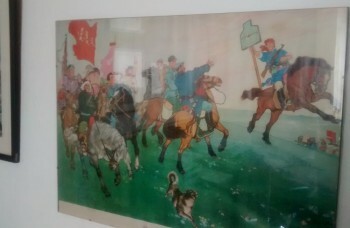 All of these attractive and jolly paintings with their theme of agricultural abundance were produced as (extremely successful) propaganda for a regime that had starved more people than any in human history. Crosby beach was fine before the Gormley figures were put in place. Time they were taken away. I now know what that silly statue at Crosby beach is. I agree with you. I’m sure that Neptune shall claim it in due course. B-i-S The last time I looked, there was a statue of a large blue chicken in Trafalgar Square, it did not flinch when the (real) Harris Hawks arrived to keep the pigeons at bay. I have never understood those who seem to think that the only valid art is that which represents something. A musical composition does not have to refer to anything outside of itself, to ‘represent’ anything, so why should a painting or sculpture? Indeed. In fact I have two of said posters on my wall staring at me now. Good grief! Was it there in November? The latest time I passed through the Square, although my priorities were more for locating the entrance to the Strand since they’ve messed with the junction, yet again. The dominant view from my apartment is “sculptural” It’s an “Osbornes”. Google it, if you like, but it’s a twenty foot high bull stuck on top of the hill, couple hundred meters away. See it for miles. When I was recently trying to give directions to chez moi I completely omitted to mention the thing. Forget it’s there unless I need to zero the scope on the air rifle..
B i S i kid not. 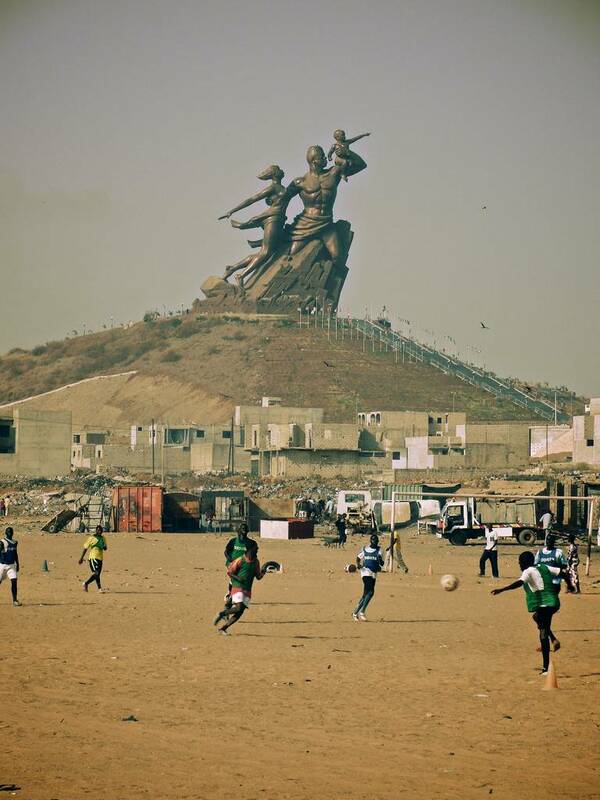 I find the statue in Senegal abhorrent, a single glance tells you it’s the product of totalitarianism. It may try to whitewash the politics of those that directed its creation, but in the end it’s no different to gigantic statues of Stalin or Saddam Hussein. In purely artistic terms too, it’s vapid. Nothing there. Jonathan Abbott, I agree. Surprisingly, Mick Hartley’s article, that Brian links too, says much the same. Here is another Hartley artillery about that NK statue factory put to work in Africa, this time, Zimbabwe. 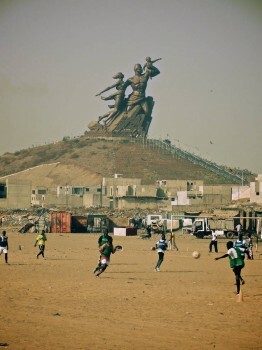 I too think the Senegal statue is abhorrent, it looks like a cast-off from the Stalinland theme park. I hope that Brian isn’t nurturing latent Leninist tendencies. There may be treatment available, like a trip to Cumbernauld in Scotland. In purely artistic terms too, it’s vapid. Nothing there. I don’t buy that at all. I find it a powerful interesting piece of art. Indeed I am a big fan of totalitarian art as a genre generally (and like most genres there is good totalitarian art and crap totalitarian art). Hell, I even tend to think certain Nazi uniforms represent the pinnacle of military tailoring in the modern era. Thus I find it not surprising at all to see said uniforms morphed into fetish clothing in the last few decades… and this by people who would not, were they to observe a genuine Nazi on fire, cross to street to piss on them. Oh and much as I think Ayn Rand had a great many profoundly true things to say, reading her fiction makes my eyes bleed. It is a purely aesthetic matter though that does not make her any less correct when she is indeed correct. I’m sorry Perry, but as far as I’m concerned the greatest single work of art yet created by any human being is Nick Drake’s Place to Be, which makes my artistic taste P.E.R.F.E.C.T. Actually, there is a pool up there so maybe he’s taking a dive. Fetish clothing? Hugo Boss is a leading fashion brand. c.f. Nazi style. There is definitely some aesthetic to it but I also think an element of the verboten has something to do with it and possibly the associations with authoritarianism. Hell, I even tend to think certain Nazi uniforms represent the pinnacle of military tailoring in the modern era. there are dozens of the Gormley figures at Crosby. I wouldn’t mind if there was just one like on top of some building in London. You could stick the lot of them on top of various buildings in London and hardly anyone would notice them. But even a few ruin a pristine, beautiful landscape like Crosby beach, never mind dozens of them. But somehow they are a work of art because the council says so. Me of course – the Emperor of the Universe. Although I should have pointed out that the way people dress (itself an art form) did not start to decline till the 1960s. Even in the early 1960s most people (not just the wealthy) did their best – now we are horrible. So one gets photographs and film of elegantly dressed men and women looking at pictures (the sort which one can not tell which way up to hang), or a concrete block buildings, or listening to discordant music. At least us modern people fit in with our vile surroundings. My father always made an effort – I do not (people do not any more). The rejection of representational monuments by the “art elite” has roots before WW II and the fascist/Communist era. Traditional monuments are identified with patriotism, militarism, established religion, monarchy, and the old (presumably bad) political order – and the bourgeoisie. Doubleplus uncool. I think another factor was the volume of elaborate, often mediocre monuments to mediocre subjects in the late 19th and early 20th centuries. The Victor Emmanuel monument in Rome, for instance, and the Albert Memorial. Washington DC has many tacky monuments to Civil War generals. Here’s another factor – the use of cement to construct cheap monuments that never looked good and quickly decayed to little better than rubbish. By the late 1900s, the general public had mostly lost interest in monuments. So those that have been built since have been designed mostly by and for the “art elite”.